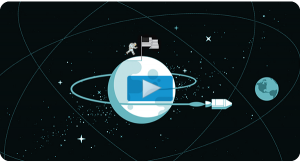 For out-of-this world landing page results, anticipate your users’ journeys! Your landing page could be ‘one great leap’ for your e-marketing activity. Or it could be just ‘one small step’. To help ensure the former, consider where people will be coming from when they arrive on it. If someone clicks on a digital ad to reach your landing page, chances are they’ll only know the minimum about your products, services or offer. Likewise, if they come to you through organic search or pay-per-click. So it’s 100% crucial your landing page is well structured, with a clear hierarchy of engaging benefit-led content. Be sure this satisfies the demand created by the ad or search-engine listing a visitor’s clicked on in the first place. Maybe your landing page traffic will be driven by people spreading the word through social media? If this is what you expect, help your message and content go truly viral by including links to your own Facebook, Twitter and other networks. Expecting lots of traffic from your email or enewsletter campaign? Then make certain your pages reproduce the visual style of the communications your customers and prospects receive first. And ensure your headlines and calls to action are consistent across the piece. Or will the bulk of your landing page visitors come via your offline advertising? If they’ve scanned a QR code with their mobile device to reach you, chances are they’ll be hitting the back button next if they’re not instantly satisfied by what they see. So always include arresting, but relevant images. Finally, to reach your page your visitors may have needed to manually enter its URL. So make this specific and campaign focused. A smart, memorable URL will help people spread the word offline, and ensure your landing page continues to be visited long after your offline collateral has lapsed. Whatever your online marketing ambitions, the Lander app helps you create beautiful, effective landing pages. Chances are you’ll find the results truly out of this world!